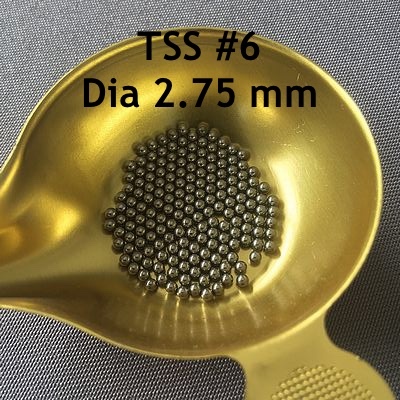 TSS # 6 diameter 2.75 mm is "THE" ball to adopt for hunting geese at long distances. It is the lead equivalent of a ball of 1 at the level of the penetration which makes it a ball well adapted to long range shots because of its important lethality. It can be used for shooting geese of all sizes. The balls of TSS #6 (2.5 mm) are perfectly adapted to shoot geese up to 75 m. In fact, the 56 mm (required for greylag goose) penetration exceeds 85 m. The pattern density at 75 m is only 1 ball per dm² for a load of 40 grams classic which is insufficient for a target that has a surface of about 2 dm². It is therefore a ball that will allow to shoot all species of geese at a very great distance but with 2 people shots. Given the penetration at 50 m, it is not recommended to draw a duck at this distance with this type of ball. The pattern density will be weak and moreover the considerable energy will probably bring the ball to cross completely the bird tissues. This is really a pellet for (big) geese to shoot with heavy loads (more than 50 grams).